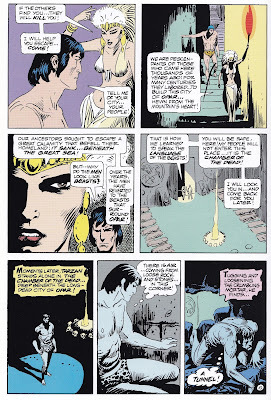 Doug: A long time ago I got the crazy idea to showcase one Conan story, "The Tower of the Elephant", but drawn by two Bronze Age masters: Barry Windsor-Smith (inked by Sal Buscema) and John Buscema (inked by Alfredo Alcala). People got a kick out it then, and lo and behold if the crazy idea didn't hit me again. Today we'll also look at the work of two masters, this time Russ Manning and Joe Kubert, both men inking their own pencils. Manning and his scribe, Gaylord DuBois, adapted the ERB tale "The Return of Tarzan" in a single issue; Joe Kubert took five issues (!) to tell his version. 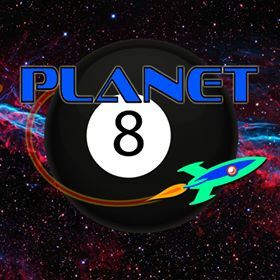 Today we'll check out a 100-Word Review of the basic plot, so those not in the know can consider themselves... in the know. Then we'll look at some key scenes as told by these two wonderful artists. Enjoy! Doug: I have to say that 100 words wasn't really enough to do the plot justice, but darned if that ellipsis didn't land after the 100th word - nailed it! Joe Kubert spent 2 1/2 issues to get to the spot where DuBois and Manning began their adaptation. Kubert gave quite a bit of backstory in regard to Tarzan's "rejection" by Jane Porter in her favor toward William Cecil Clayton, Tarzan's cousin and Lord Greystoke. Tarzan's friend, Lt. D'Arnot had gotten Tarzan a position as an international spy (just suspend your disbelief, OK? 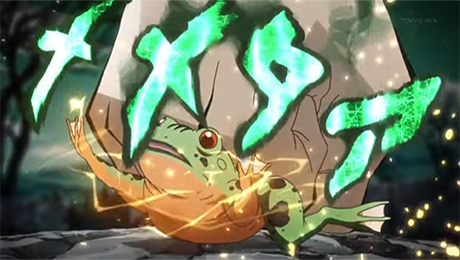 ), and our hero encountered a certain Nikoklas Rokoff. Rokoff was a dangerous Russian criminal intent on all manner of do-badding. 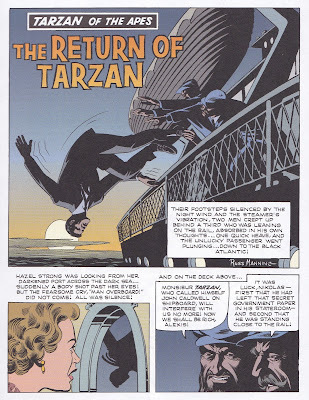 It was Rokoff and his assistant who assaulted Tarzan unawares on the ship's deck. But before that had happened, Tarzan had by chance met Hazel Strong, the best friend of Jane Porter. What a coincidence - to be sailing near the southern tip of Africa with an American woman from Baltimore who just happens to be friendly with the forbidden fruit of your dreams. Man... And then when she tells that Jane doesn't want to marry Lord Greystoke but some Tarzan fellow she'd met in the jungle... Of course, being chucked into the sea sort of put all that on the back burner. 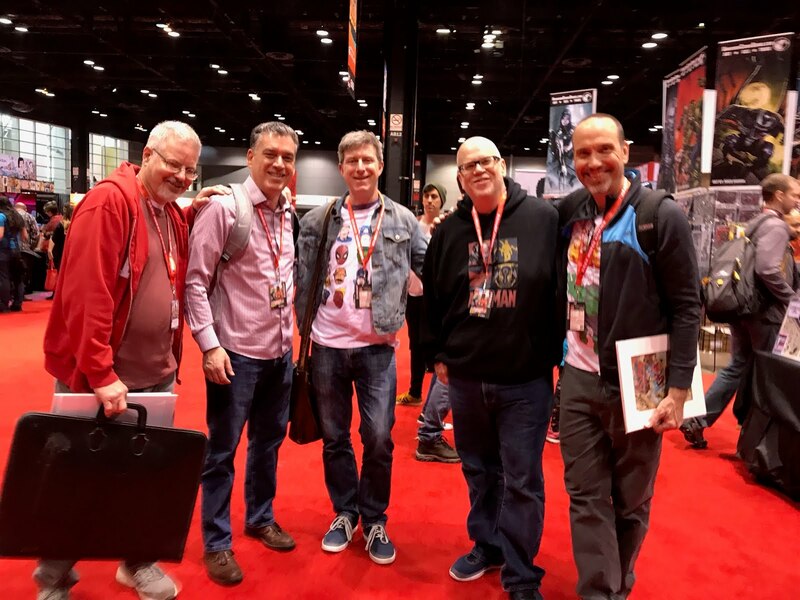 Doug: I'm going to choose several examples of Manning and Kubert telling the same parts of this story. I think you'll see how illustrative Manning's work was, and how raw Kubert's was. 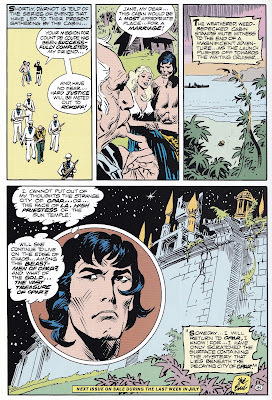 Manning's work sort of feels like the Ron Ely Tarzan television show; Kubert's feels more like the Christopher Lambert film, Greystoke: The Legend of Tarzan, Lord of the Apes. I'd also say that Manning's women evoke the glamour girls of 1940's Hollywood. When necessary, I'll tell you what's going on, or where the two men parted company in just how they told this story. You can imagine that with Manning using 24 pages and Kubert exercising his prowess over 90 pages there were some differences. However, what really interested me were some details that I felt were important to the story that Kubert skipped altogether, and how each penciler put certain events in a different order. Doing this post makes me want to reread the Burroughs novel! 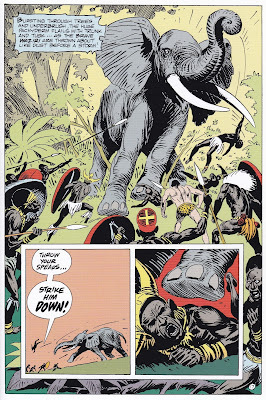 Scans today are coming your way from the Tarzan Comics Library, Volume One (Dark Horse Comics 1999) and Tarzan: The Joe Kubert Years, Volume Two (Dark Horse Comics, 2006). Manning gets after it right away; it took Kubert almost three full issues to get to this scene below! Interesting how the creators handle this scene with the lion. 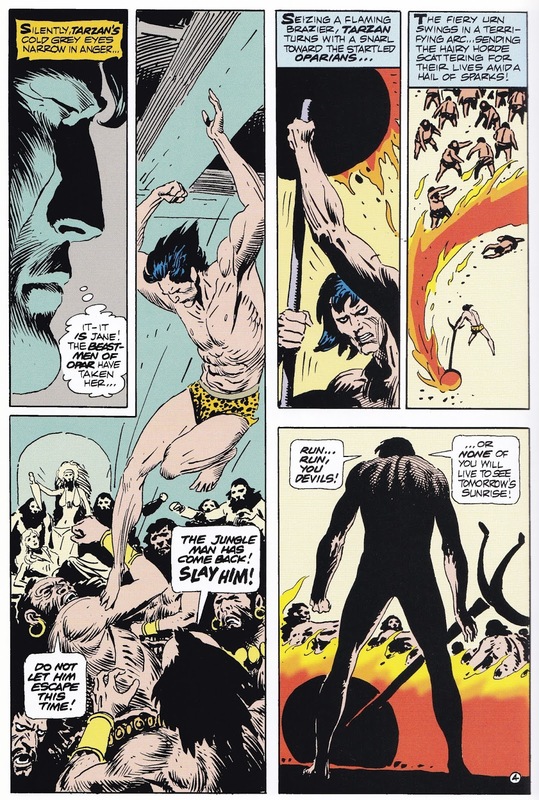 In the Manning issue Tarzan loses his balance and needs to be saved by the African; Kubert has the ape-man ever dominant. 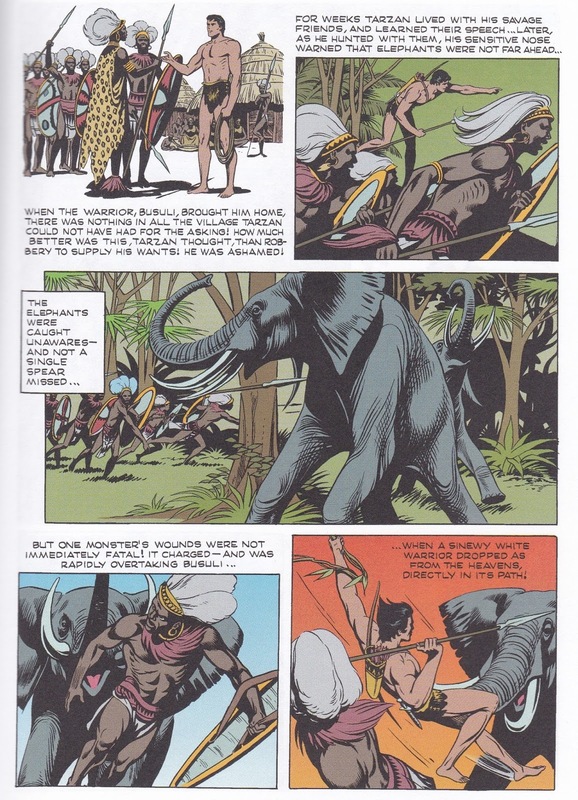 We can infer that Tarzan intended to kill the African for his weapons, but Kubert's jungle lord thinks to himself that he could never kill to steal -- Kubert's scene shows a more skillful and noble Tarzan. Here, Tarzan -- apparently no environmentalist, agrees to go on an elephant hunt with his new friends. 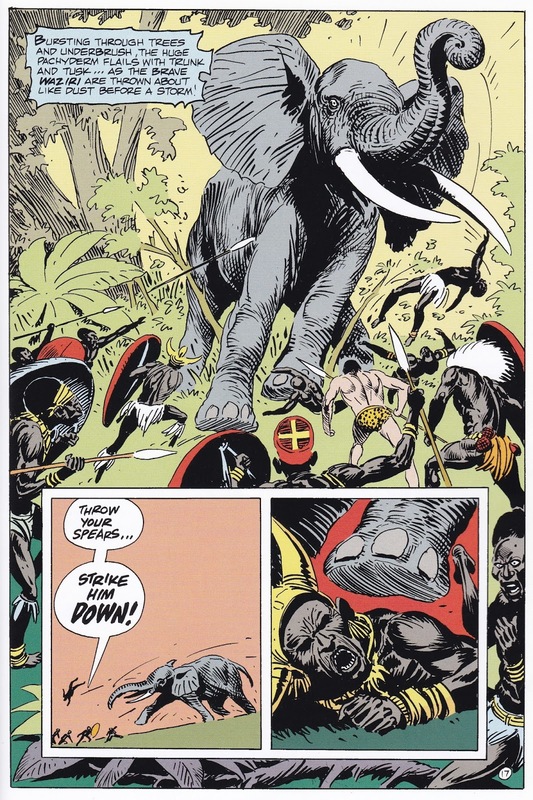 Kubert presents the scene as a rogue elephant has endangered the compound and must be dealt with. 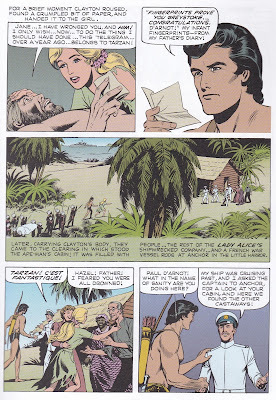 In both stories, Tarzan learns of a lost city filled with gold. 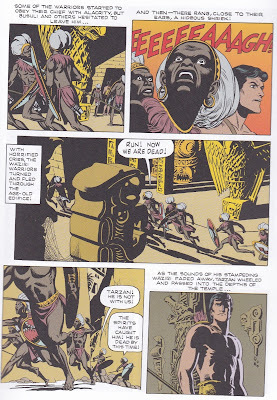 A member of the Waziri tells him the rumors, so Tarzan selects 50 strong warriors to accompany him on his search. However, stereotypical "savage" superstitions get in the way of the mission. I'm always digging the 50 Frightful Men -- Burroughs painted such a picture in my mind that artists' renditions always fall a little short in comparison to the way I'd originally "seen" these brutes... sort of like the Seven Dwarfs as craggy cave men. La. I think Manning got it "right" moreso than did Kubert. Of course, many artists have tried their hand at depicting the high priestess -- click here. In the scene below, Tarzan protects La from a mad suitor. The great escape. This is another scene that Burroughs did a great job of painting for me. 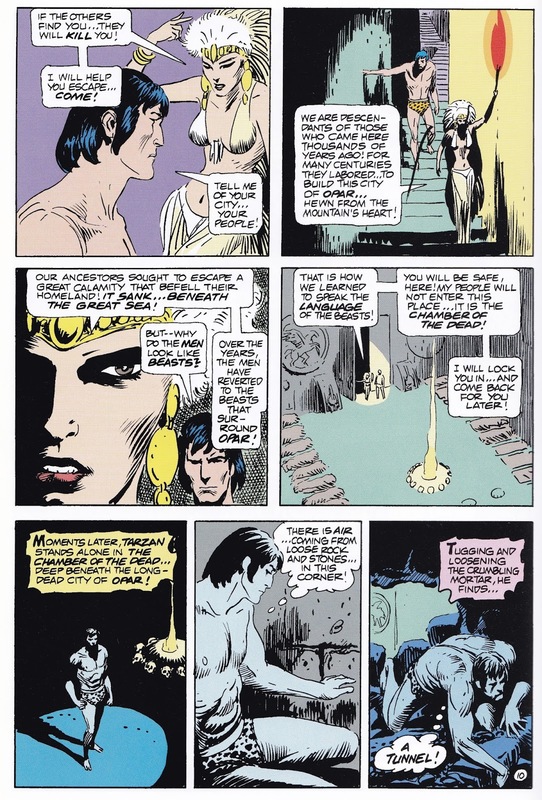 It's interesting that Manning has Tarzan find the gold right away; in Kubert's version Tarzan leaves to meet up with the Waziri and then comes back and discovers the gold later. Of course, what would a Tarzan epic be if there wasn't a scene where Jane Porter fell into mortal danger? Here she is captured by the 50 Frightful Men and taken to Opar. Again, Manning and Kubert tell this scene a bit differently, and spaced differently in the order of events. Tarzan weds his lady. Jane nee Porter becomes Mrs. John Clayton, Lady Greystoke. I hope you enjoyed our joint tour of these two tellings of The Return of Tarzan. 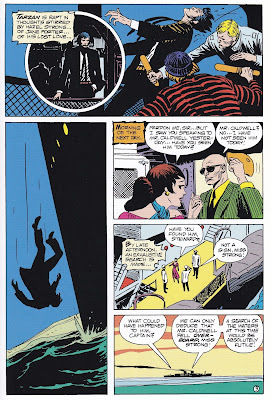 I found it fascinating as I read each story how the creators chose to tell certain parts, to take artistic liberties with Burroughs' original writing, and even to reorganize major plot points. I hope you had a good time looking at the samples I've provided today. Doug: I actually saw this on Thursday (3/24/16), but didn't want to hijack Martinex's $1 Challenge. 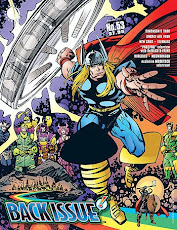 Those of you who have found pleasure in my various reveals of the IDW Artist Editions may recall that I've pre-ordered the Jack Kirby's Thor book that is supposed to ship in May. Here's a link to a site offering glimpses of the book -- spectacular stuff! Awesome job there, Doug. You put a lot of work into this one. Personally, I'd have to give Kubert the win here. 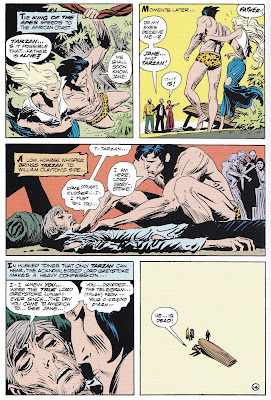 I like Manning's clean style (it reminds me a lot of Alex Toth or Wally Wood), but I think that Kubert's kinetic artwork lends itself better to a character like Tarzan. I especially like Kubert's version of the cover. I wish the sample was bigger so I could get a better look at it. I'll have to try to Google it. Yes, apologies William. That image size was what was posted at the Comic Book Database. The Gold Key cover does enlarge nicely. Thanks for the compliments - it wasn't too much work. I really enjoyed reading the different nuances in the adaptation of the Burroughs story. For me, Joe Kubert's Tarzan is the only version that I really like. Kubert's art is fantastic, the kineticism William mentions makes for more dynamic storytelling. Manning' start is pristine and definitely worth the price of admission. I like that Kubert's animals are more nightmarish, his jungles are dirtier, and his ape-man more brutish. I own about half his run and hope to dig up the rest. I have Kubert's entire run in those Dark Horse Archives, as well as the first volume of the IDW Artist Edition. I agree with you -- his work on the Ape-Man is worth just about any price of admission. I also have a great deal of Manning's output in the three digest-sized volumes that Dark Horse also published (and which I used for today's scans). They are really nice, but I do wish I had the reprints at regular comic size. When it comes to Tarzan, I'm more of a Burne Hogarth man... here, though, while I like both versions well enough, I definitely prefer the Kubert for pretty much the same reasons as William and Mike L.
Obviously both artists had quite different styles, but I reckon you can also see the result of changing approaches in US comics over that eight year period. 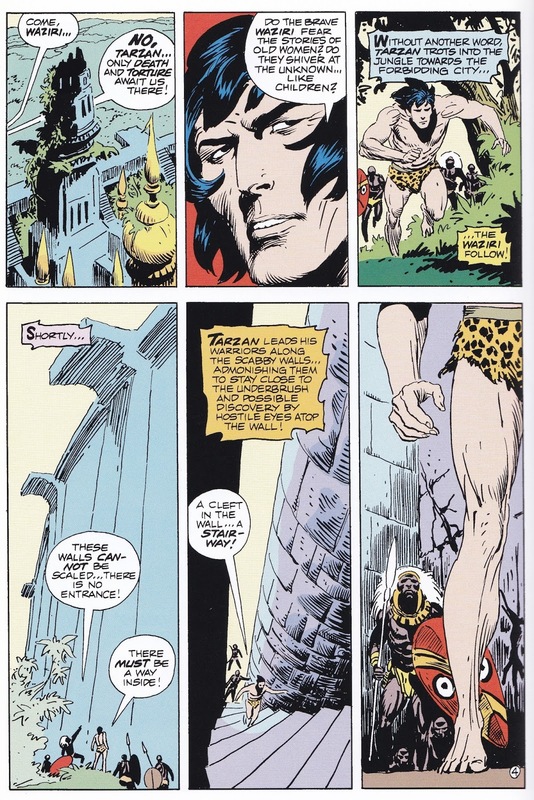 And maybe the broader culture... you can sort of measure the change in public tastes - and even values - through Tarzan, who really went out of fashion over the course of the 70s (I believe DC expected much better sales after taking over the licence from Gold Key, let alone Marvel later). Anyway, enjoyed this a lot Doug, so thanks. It is really great seeing these works side by side like this to compare individual artistic style as well as the change of sensibilities over the years. Even Tarzan's hair seems to leave some perspective on how the times changed. 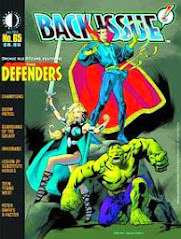 Manning's work almost seems like a documentary with definite strains of Classics Illustrated woven in, while Kubert's is more blockbuster action with different angles and more in the face adventure. Both are great artists. 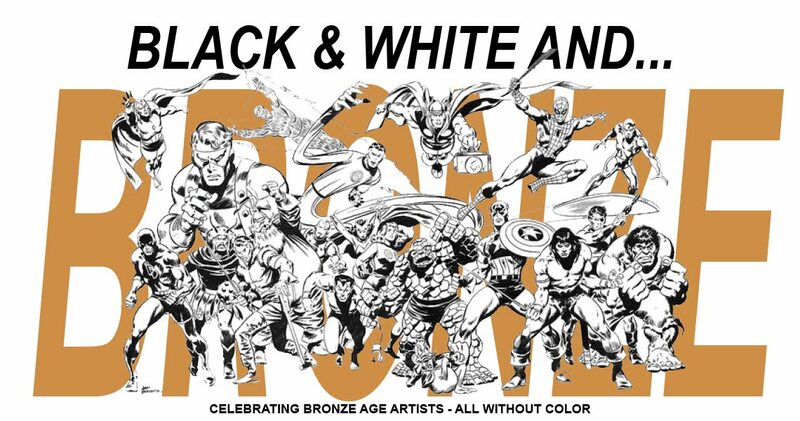 Considering other artists of the era, you can understand how some adapted to the changing sensibilities of the burgeoning silver age and how some may have been less successful. I've read the post three times just trying to compare panels and the script; really great post. And on the PS, the IDW stuff looks great again. Those guys really turn out nice product consistently. 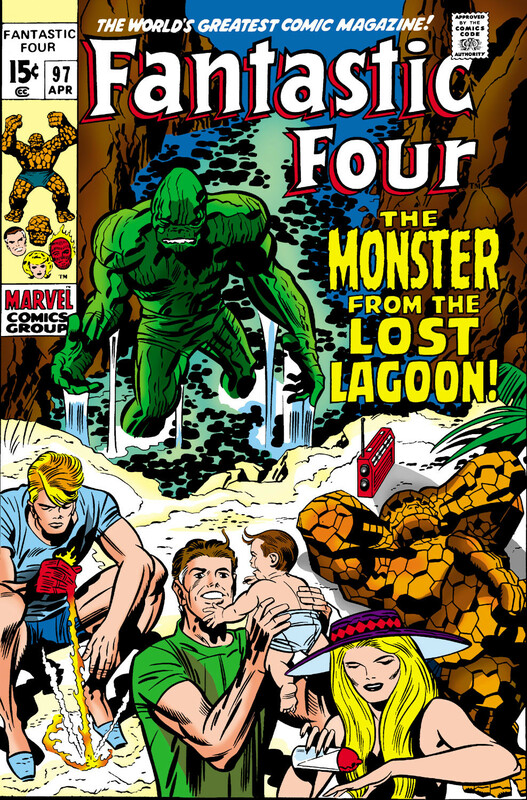 The Kirby work intrigues me; he definitely adapted through changing times and was so far ahead of his time. As to the artists discussed today: Manning's work is sharp; clean and clear. However, I have to go with the Kubert crowd as a favorite. His work has a kind of restrained tension; his lines both descriptive and expressive. 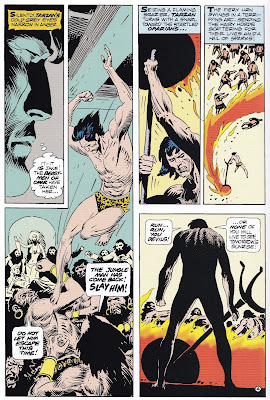 Doug, re: your suggestion for some kind of reprint of Marvel's Tarzan (preferably in color) - oh, so co-signed. Otherwise, like the previous Conan post, I love this, both the idea and today's topic. Let me add my praise for your selection of pages. Looking them over, I generally prefer the Kubert pages by far. Manning's work, while quite nice, is just a bit too tame, while Kubert's vision is grittier and more evocative. However, I agree with you that Manning's vision of La is better, although on the other hand, I prefer Kubert's version of Jane. Although I should add - probably to no one's surprise - that I think Buscema drew both of them better than either Manning or Kubert. Cool post, Doug. Return of Tarzan is one of my favourite novels. As for the art, I'd have to go with Kubert, though Manning's obviously no slouch either. The Return of Tarzan if among my absolute favorite novels, and I'm delighted to see it get such a high profile assessment here. 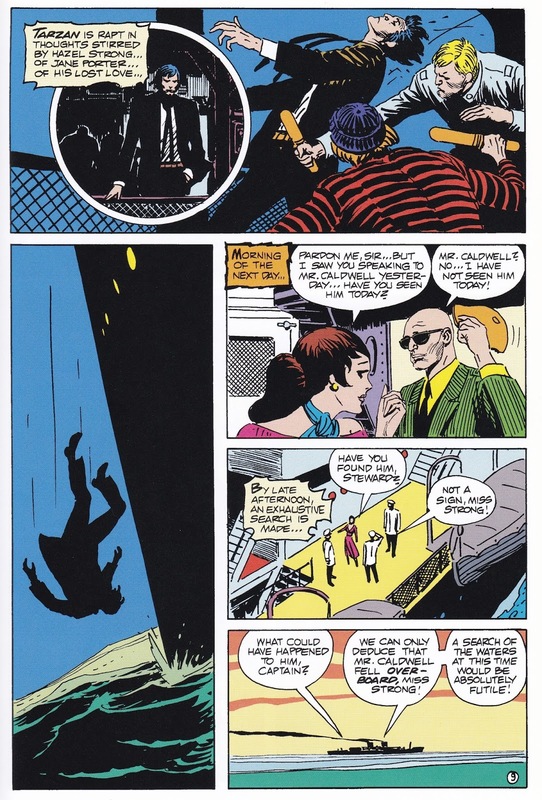 Manning's story of course was told in a single issue magnifying the need for brevity while Kubert had the luxury of several issues to properly pace the story. Manning's sleek Ape Man is iconic but his clean-limbed superman is secondary in my imagination to Kubert's more aggressive and more rustic rendition. I'm a Kubert fan and prefer his style here, for the layouts and emotional intensity. Manning is solid, but I'd like some more expressive inking over his pencils. Great post Doug! Really enjoyed looking through these. Star Trek at 50: What Are Little Girls Made Of? Who's the Best... Sporting Event? Who's the Worst... Amazing Doohickey?